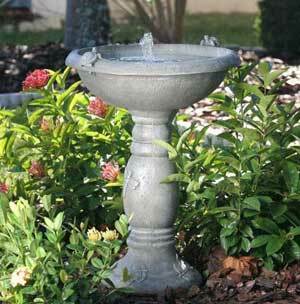 Country Gardens Solar Birdbath. This solar bird bath allows an umbrella spary. This solar bird bath provides moving water when the sun is out, which attracts birds, keeps your bird bath clean longer, and prevents west nile. There are two fountain heads that allows an umbrella spray or bubbling. Features two turtles resting on the edge of the bowl and the fountain. Includes an insert dish to function as a birdbath during periods of unattended use. Item is Approximately 28" tall with the basin being 21" across.